Fidelio, Ludwig van Beethoven’s sole opera, contains one of the most dramatic stories in the genre. Its heroine, Leonora, disguised as a man - the Fidelio of the title - inveigles her way into the prison where her husband, Florestan, is held captive. With the impending arrival of the minister of justice, Don Fernando, the prison governor, Don Pizarro, decides to kill Florestan rather than risk the fact that he is being detained illegally coming to light. Forced to dig Florestan’s grave, ahead of his assassination, only Leonora stands in the way of Pizarro carrying out his plans. When Fidelio received its premiere on 20 November 1805, the Theater an der Wien was virtually empty; Napoleon Bonaparte’s troops were at the gates of Vienna and many of Ludwig van Beethoven’s patrons had fled the city. Two nights later, the opera’s first run came to an inauspicious end. That might have spelt the end of Fidelio, but astonishingly, some eight years later, as Napoleon’s grip on Europe began to loosen, Beethoven was invited to revive the opera. Famously intolerant of anyone meddling with his music, he had revised the work under sufferance in 1806 to create a version that only lasted two performances. This time, however, he gladly insisted on making changes, resulting in the opera we know today and delivering its greatest moment, Florestan’s aria, "In des Lebens Frühlingstagen", in which the prisoner’s delirium makes him see his wife as an angel come to release him from his turmoil. 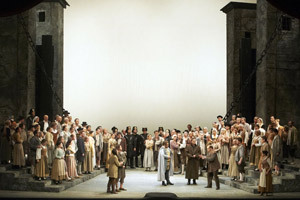 Premiered at Vienna’s Kärntnertortheater on 23 May 1814, the definitive version of Fidelio was at last a success and has enjoyed many memorable performances at the Wiener Staatsoper. Now set to grace the stage of the Vienna State Opera once again, Fidelio is Beethoven at his most defiant.